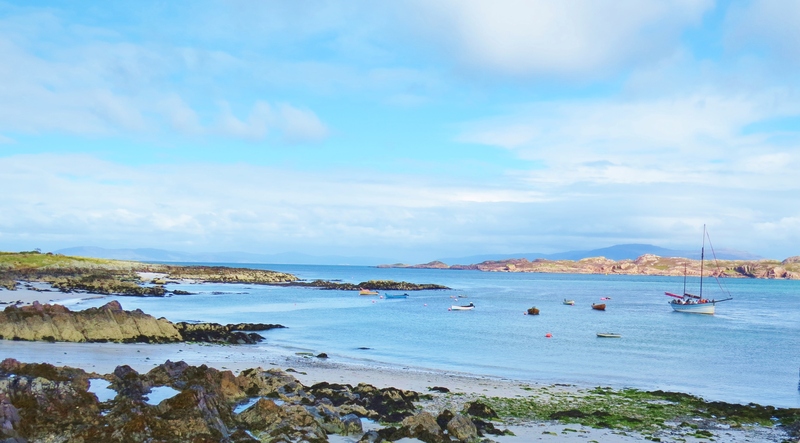 Iona is famous the world over – hailed as the cradle of Scottish Christianity. Computer searches almost always start the island’s story in 563 AD when the Irish missionary, Columba, arrived there with twelve followers and founded Scotland’s first Christian church and monastery. This over-simplifies history and does not do justice to this tiny dot in the Atlantic ocean that, since ancient times, has drawn pilgrims and scholars from far-flung places seeking healing of their souls; a place to lay down the burden of life for a short time; a chance to celebrate their Christian faith; a spiritual experience or for more secular reasons like historical or geological; architectural interest or just curiosity. It is thought likely that Iona was a sacred place long before Columba arrived. A Bronze Age burial ground is still in evidence and an Iron Age Vallum (earthwork enclosure) surrounds Iona Abbey rebuilt on the site of Columba’s original 6th century monastic community. The Vallum is evidence of an Iron Age hill fort. It is probably a safe assumption that the majority of visitors to Iona are there to visit the abbey which stands atop the foundations of the original, built in the 12th century on the site of that first 6th century monastery; some to marvel at the medieval parts of the building still remaining; others to walk in the footsteps of a Saint. For those who wish a comprehensive history of the abbey, its times of peace and those of violence and bloodshed, there are several internet sites devoted to the subject. Suffice to say here that Kings, Lords, Clan Chiefs, assorted Norsemen including a Viking are buried there, some of their gravestones kept safe in a tiny museum housed in an 8th century chapel. One Norse king became a monk at the abbey. The island certainly has an other-worldy atmosphere. Even though dozens of monks were slaughtered by the Vikings on Martyr’s Beach in 806 AD, I felt only a deep peace there. 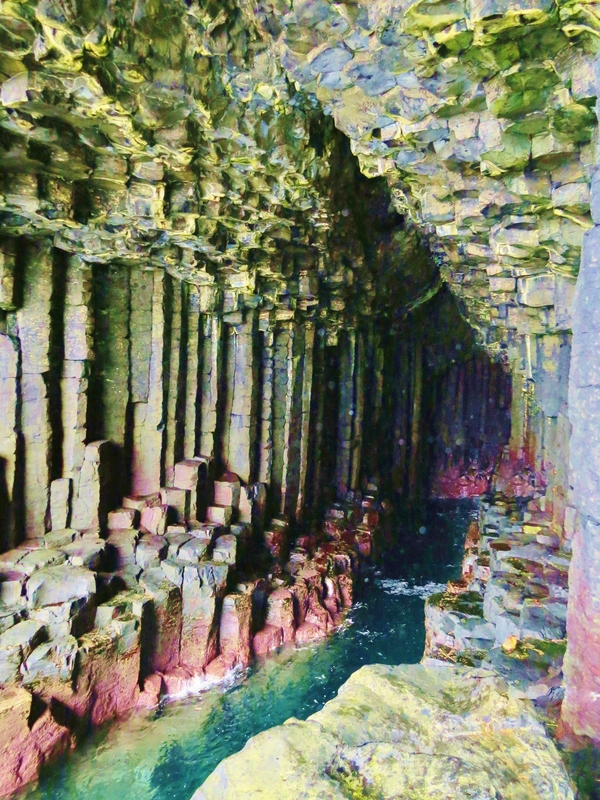 The black, basalt fragments littering the beach were a reminder that this was only 8 miles from wild, rocky Staffa. The smooth rounded surfaces attested to the eons they had spent being polished by the waves. In the mid 12th century, Somerled, King of the Isles, rebuilt the abbey, burnt by the Vikings during their last raid of Iona in 825AD, when the remaining monks were slain. Many had fled to Europe or back to Ireland. In 1200 AD, his son, Ranald, brought in Benedictine monks and also established an Augustine nunnery. This was run as a retirement home for noble ladies of Argyll until its destruction during the Reformation. While the abbey and nunnery were dissolved and left in ruins, the magnetic draw of Iona as a place of importance persisted and in 1609 King James VI chose the island as the setting for the signing of the Statutes of Iona, designed to curb the power of the clans and their chiefs and to erase the cultural division between the Highlands and Lowlands of Scotland. For reasons unknown, the nunnery was never restored as was the abbey. It remains the best example of medieval architecture anywhere in Scotland. 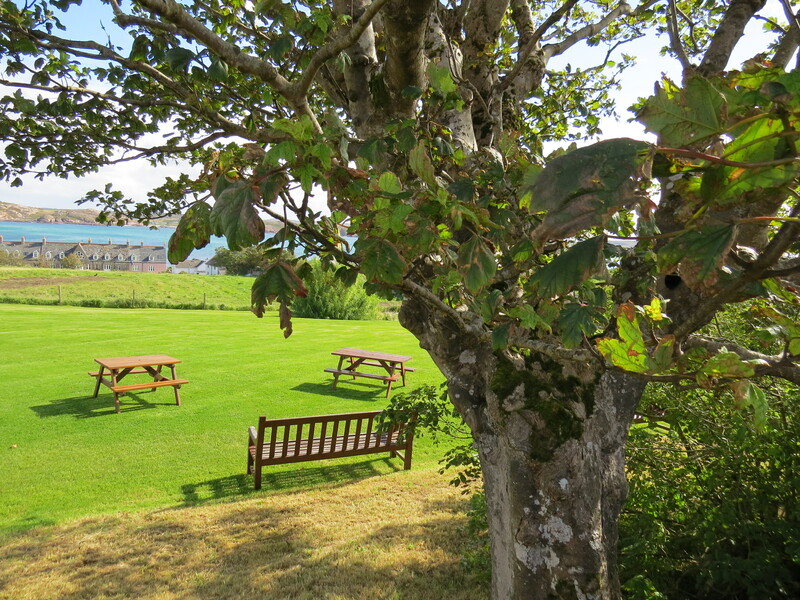 Some of the gardens planted by the nuns of the island are still very much in evidence, some wild among the ruins, others lovingly tended by St Columba Hotel employees. The road leading from the nunnery to the abbey and burial ground there is known as The Street of The Dead. Of particular interest on this short route is a stone cross erected around 1500 AD. Carved from one lump of granite, it is 3 metres high and known as MacLean’s Cross. Anna MacLean was prioress at the nunnery at that time so no doubt there is a connection to her or her prominent family. Facing the Atlantic ocean, unsheltered and having been exposed to the elements for over 500 years it is in amazingly good condition. The building behind the cross is a restored 8th century chapel now a museum that houses gravestones and other ancient, well preserved relics. St Columba brought more than Christianity to Iona. He built a library and scriptorium where much if the Book Of Kells was written. Wikipedia describes the work as ‘a masterwork of Western calligraphy and the pinnacle of insular illumination.’ For safekeeping from Vikings and other spoilers, it was taken from Iona perhaps, briefly, to Lindisfarne, a tidal island off the northeast coast of England. This less prominent monastic community was also targeted by Vikings, but the Book of Kells was taken to the safety of Ireland where it was completed, perhaps by some of those same monks who first created it before fleeing from the Vikings on Iona back to Ireland. It now has pride of place at Trinity College, Dublin and is considered Ireland’s finest national treasure. Today, the hub of Iona is still around the abbey as it was in 6th century. Life is more bucolic than academic, but religious faith, while not as obvious, is still represented by the Iona Community. It is described as ‘a thin place’, meaning a place where there is only a flimsy veil between this world and that of those now passed to the realm of spirits. Certainly something extraordinary has drawn and continues to draw legions of people to this tiny, pleasant but relatively unremarkable looking island. CalMac ferry leaving Iona with the Isle of Mull in the background.